Robert Fritz (b. 1943) divides his book on becoming a creative thinker, The Path of Least Resistance, into two parts. Part One deals with fundamental principles. Part Two with the creative process itself. Fritz’s central argument is that most people can “learn to create.” Given the words of the first of the two creation narratives in Genesis this point is, at least to my mind, one that orthodox Christians should accept without hesitation. 28 God blessed them, and God said to them, “Be fruitful and multiply, and fill the earth and subdue it; and have dominion over the fish of the sea and over the birds of the air and over every living thing that moves upon the earth” (Genesis 1:26-28, NRSV). Robert Fritz is a composer and musician by training. He found the creative process so endlessly fascinating that he “integrated a multitude of dimensions [regarding] human nature, from the intellectual to the spiritual, the rational to the intuitive, the subjective to the objective, the technical to the metaphysical, the scientific to the religious” (xxi). The result is this book. While the book is filled with simple and genuinely helpful insights, it is much too-long (285 pages). An economy of words would have served his purpose in my view. Creators, writes Fritz, “are an enigma to many people, because creators seem to tolerate apparent contradictions quite easily” (xxi). Creators do not see these problems as contradictions but as opposites that need to be balanced. Fritz thus learned about creating by being around creative people. In 1975 he was asked to teach people about what he had learned about the process of creating and the result was an entire curriculum and several books. “The desire to create is not limited by beliefs, nationality, creed, educational background, or era. This urge resides in all of us, but few of us have been raised in this tradition” (13). “What you really learned as a child is that circumstances are the dominant force in your life” (17). “There is nothing really new in the ‘New Age,” just new forms of response. The orientation is identical to that of the ‘Old Age’” (19). 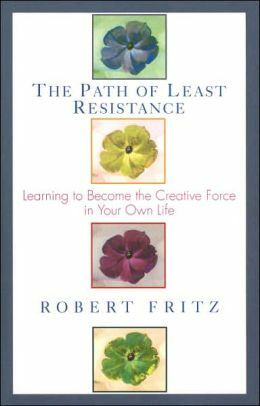 Fritz calls the way most of us have learned to avoid creative hard work “the reactive-responsive orientation.” Most of us learned this behavior from our childhood and thus avoid creativity without even knowing why. To be creative requires that we see what we wish to do and then follow a definite process that allows us to create. Every great, or not so great, discovery that anyone has ever made has, to a large degree, followed this pattern. The problem is not in creating. Creating is natural to us. The problem is in believing that problem solving is more important than creating. It is at this very point that I think Fritz’s account applies directly to the work of most Christian leaders and churches that I’ve known. The profound difference between imagining a desired outcome and actually pursuing it, versus trying to solve problems, is huge. “Creating is taking action to have something come into being–the creation” (31). The greatness of creative acts cannot be separated from the greatness of the men and women who create. What is required is not “breakthroughs” but “continual learning.” Several of the greatest examples of this are Thomas Edison and the Wright brothers. They persisted toward a definite purpose and kept learning. They refused to believe all the naysayers were right and the result was a creative end that was attained through persistent trial and error. The same principle is true for spiritual creativity. Let me explain. I have a vision, or an end, for which I have received a calling from God. This end is to see more and more Christians come into an experience of John 17:20-23 and to see churches, missions and leaders united in Christ across many things that have typically kept us apart. I have some very definite ideas about what this looks like and I call the vision missional-ecumenism. Even the term is one that many (especially conservatives) do not like. Some friends even tried to talk me out of it. But I believe the words, when rightly understood, communicate a big and audacious God-shaped, God-sized, dream of what happens when God moves in his grace to bring more and more of us together in the mission of his kingdom. This is not my model. I got it from the Scripture and developed it by learning, processing and thinking about it very deeply. I began to teach it and then I learned how this could actually be done in real life situations. Now I share the teaching and relate stories about how it works. I believe my dream will be realized. I also believe that I am called to trust God and creatively help bring others into this vision. This dream, and an honest pursuit of it, is not the same thing as problem solving. Problem solving does not allow people to create what they see in the future and very often perpetuates precisely what they do not want (41). If I try to help Christian leaders solve the problem of disunity my vision can not be realized. What I must do is help people imagine what a different future will look like when God moves in his grace and power to answer the prayer of Jesus in John 17. Fritz writes, “Almost all of life’s desires can be the subject of the creative process” (49). Having read this fine book I must agree. The steps to the creative process are simple to describe but they are not a formula. I have intuitively understood this for decades but Fritz has helped me think about what this means. Each step in a creative process follows certain actions. Some of these actions are active and some are more passive. “The stock in trade of a creator are the abilities to experiment and to evaluate one’s experiments” (53). Finally, “It is not fortitude, willpower, or determination that enables you to continue the creative process, but learning as you go” (54). It seems to me that a Christian with a big vision of what God is doing can “learn as you go” and thereby humbly trust God to produce the results. My goal, more than ever, is to see what can be done and to learn how to pursue it creatively so that it will be done. God’s part is to bring about what he purposes to do. I can confidently know that he wants his people to be “one” in the bonds of Christ’s love. I have no idea, at least most of the time, how we do this when we still have so many reasons to divide and stay apart. But I intend to creatively pursue the calling of God regardless of opposition and the way forward is to be more faithful and creative.